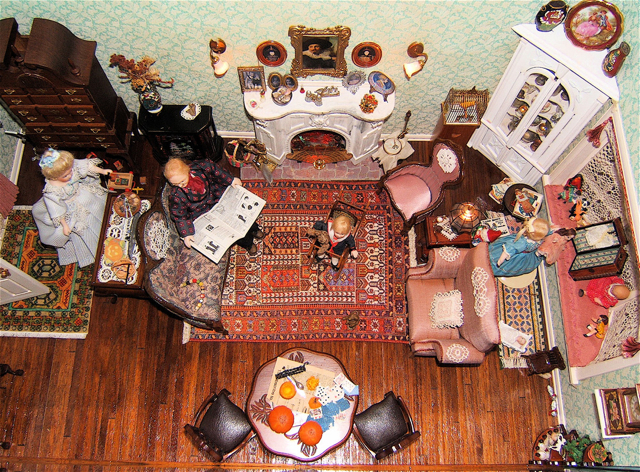 At the time I was ready for people in my dollhouse room, I was collecting old and new porcelain dolls. I took a workshop to make a miniature lady doll so I would know how and what went into the creation of good porcelain. This lady is the result. Setting her glass eyes was the most challenging part to me ... she ended up a bit cross-eyed. Her hair is made from silk roving. Curls were made by wetting a small hank, wrapping it around knitting needles, and then baking it at a low temperature to set the curls. I enjoyed the process of creating her, but only needed to make one doll from "scratch". I purchased the already painted and fired porcelain body parts to construct the people and toy dolls for this dollhouse room. Both ladies dresses are made from silk fabric. They're wearing all the appropriate undergarments and hooped petticoats from the Victorian era. They even have silk stockings and high-heeled shoes made from fine leather. The baby's smocked dress and bonnet are Swiss batiste cotton. I had knitted the baby blanket from sewing thread using the the largest sewing needles I had to knit it. As you can see, the dolls are small, especially the dolly. She's also wearing a smocked silk chiffon dress with petticoats and leather shoes. As I recall, all the dolls shoes were made from old kid leather gloves. You may recognize that I've done English smocking, which is a surface embroidery across pleated fabric. This scale is too small to make pleats by rows of running stitches. Tiny pleats were formed by drawing up threads in the fabric weave at even intervals. It was hard to see the gathering thread as a guideline for the embroidery, so I drew chalk lines to help me evenly space the smocking stitches. I'm glad I did all of this about thirty years ago when my eyesight was good. I could never see to work on this scale today. They are so pretty. I just love the addition of the baby in the Christening gown. You did a great job. That an incredible dollhouse. Thank you for sharing it. When I was the library yesterday, I was looking at the miniatures book. I left them there though, I don't need another hobby - but I do have a doll house kit that isn't made - and furniture as well. Wow! I am blown away! You have incredible patience! Such intricate work, What an accomplishment. Thanks for showing us. These are amazing Nellie - there aren't enough superlatives to describe them - you must be so proud of all the thought and work that went into making them, not to mention skill. I need to call in the Coast guard for a fog light just to thread the needle of my sewing machine! So to think about things at this tiny scale, is just amazing! So many great details! May I come and play with you please? This doll house and its inhabitants are incredibly beautiful! Thank all of you for your compliments. I liked the challenge of making things look "real" on this small scale. verobirdie, I do wish you could come to play. The last time that room was changed was several years ago when a seven-year old neighbor girl came to help me set this up. She's since moved away. Just maybe I'll get it decorated for Christmas this year. Such detail....Amazing. Thanks so much for sharing the details on how you created each piece.... very interesting. Your dolls are amazing Nellie - I have very much enjoyed reading about them. Many thanks for your lovely comments about the bird made from your pattern on my blog. I too am amazed at the detail of these dolls and their beautiful outfits. Would love to see a Christmas decorated dollhouse this year. I never had a doll house growing up. But my mother was very creative and she would take cardboard boxes and scraps of wall paper and wallpaper the walls, cutout windows, and make curtains out of scrap fabric. We would play for hours and hours with those houses. Nellie, I just had to say THANK YOU as a few of us girls got together to create birds......from your pattern and we had such fun and it was a joy and we sang your praises for the pattern and instructions.......so generous! You can see the birdie I created on my blog! You are wonderful! Oh boy. I wish I had read this post BEFORE I tried to make a doll recently...it would have been very helpful to know I could have bought porcelain faces already made!!! Thanks for this post.